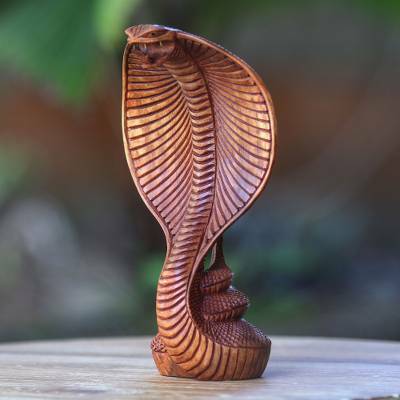 Hand Carved Wood Snake Sculpture, "Cobra"
In an amazing display of his eye for detail and steady hand, Wayan Rendah carves accacia wood into an incredibly realistic portrayal of a poisonous cobra. The serpent's arched head and coiled tail reveal its strength and charisma in a powerful way. In Bali, the cobra is considered a holy serpent, often portrayed in the company of Siwa, the god of balance. Siwa is one of the three gods in Bali that governs birth, life and death. Siwa is often shown with a cobra that rests on his head and around his neck while he peacefully sits in a meditative state. I was struck by the design and theme of this item looking at it on the Novica website. I ordered it and was even more impressed viewing it at home. The detail is amazing. Every cut is perfect. To me this item represents power and beauty. It is a wonderful addition to my art collection. "Most wonderful woodcarving. My visitors are amazed"
Perfect artistry. Must be a wonderful artist. It is truly lifelike. The workmanship is incredible. The wood, the stain and the intricacy is unbelievable. Thank you Wayan for this creation - I will treasure it for many years. The detail is amazing. Well worth the money.